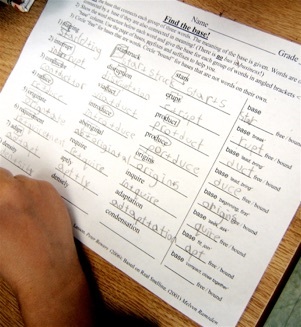 WordWorks & Real Spelling in the Classroom Grades 4 & Up! Our old friend Sean Lonergan rubs his hands with glee thinking of all the words he and his Grade 5 students at St. Marguerite Bourgeoys can build with his ever expanding wall of morphemes. They seem to be running out of room for free bases, and the bound base chart is not far behind! Grade 5 Students at St. Marguerite Bourgeoys Running out of Space for Morphemes! Does <hearth> have a <heart>? 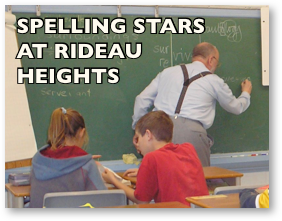 Tristen is a a Grade 5 student at Rideau Heights. He and his classmates have been benefiting from the word structure knowledge his teacher has been developing in the WordWorks Teacher Course and the culture of inquiry and learning that has always been central to Skot Caldwell’s class. 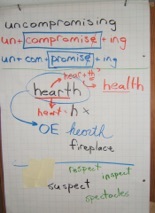 Click here to see the brilliant problem-solving and research Tristen and his class did to determine whether or not the spelling link he noticed between the words <hearth> and <heart> is meaningful or accidental. Consider your own hypothesis before Tristen makes his case. Then go to Vocabulary Acquisition: Implications for Reading Comprehension to consider conclusions drawn by two of the authors with chapters in this book. Students in Skot’s grade 4/5 class dive into dictionaries as Melvyn works on a matrix for the base <vive> for ‘life’ during his visit to Kingston. 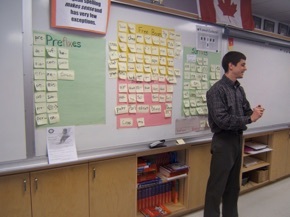 The combined matrix and word web was already created in Mr. Caldwell’s class before Melvyn’s visit. For responses to the questions this inquisitive class generated since that visit, click here. These images illustrate the kind of investigations that engage students and teachers who work at understanding the link between the structure and meaning in words. 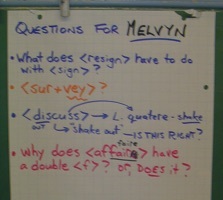 Note that the questions listed are real questions that both the students and teacher are trying to learn together. Teachers don’t need to know the answers to all the questions before they start to work with the writing system. Mr. Caldwell is not only helping his students understand the underlying order of English spelling, he is modelling the process of learning with them. 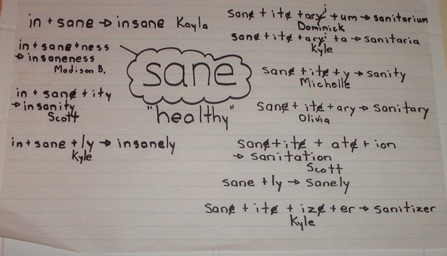 These word webs on the base <sane> were created by Sean Lonergan’s Grade 5 class at St. Marguerite Bourgeoys in Kingston. 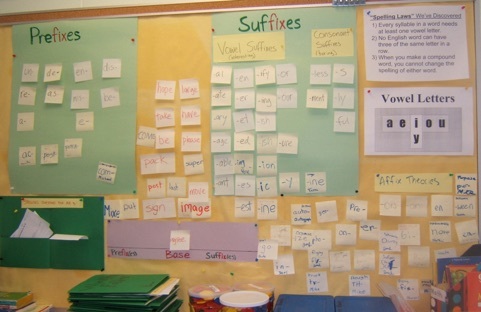 Notice the link between problem-solving of word sums, spelling and vocabulary development. 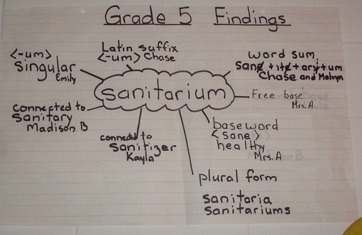 Consider the instruction happening in classes using WordWorks, with the support of Real Spelling. This question by a Grade 5 Spelling Detective was on our “Question Wall of Fame”. The student identified a tricky pattern the class had to work to solve. Do you know why we have to use the <-es> for the plural of <fox>, but just <-s> for the plural of <cat> or <dog>? The same reason explains why you need to use the <-es> instead of the <-s> suffix for the plural <package>, even though both suffixes would create the same spelling. This student question about the spelling of the simple word <packages> led to discoveries about a variety of principles involved in the spelling of countless words. For example, we were reminded of the basic spelling “law” that every spoken syllable requires at least one vowel letter. We also learned the pattern for when the letter <g> can be pronounced /g/ or /j/. That lesson made it easy to learn the pattern for when the letter <c> is hard or soft too. Click the picture of the “Spelling Detectives!” question for a pdf of the lesson that resulted from sharp Grade 5 orthographic thinking. Below are some examples of more word detectives from St. Patrick Catholic School in Harrowsmith. 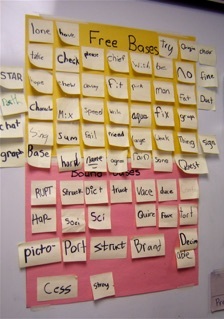 Word Walls that Show How Words Work! A student finishes up on his “Find the Base” investigation page that presents a number of common bound and free bases within connected words. 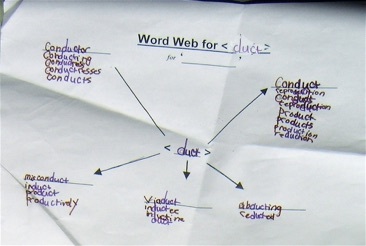 Another student chooses one of the bases from the “Find a Base Activity”, and with the help of the Word Searcher, builds a word web on the base <duct> for ‘lead, bring’. A chart of morphemes is growing beyond capacity. As students work on various activities, they can choose to nominate affixes that they think deserve to be on the official class chart. They have to write the affix, and the word in which it was found. 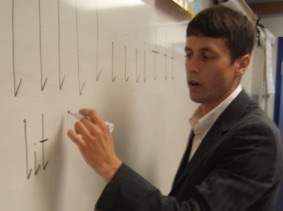 Mr. B. was clearly getting behind in checking the pile of “Affix Theories” at the point when this picture was taken. He’s also behind on answering the questions in the green folder at the left for “Spelling Questions for Mr. B”. Students fill out these questions about spelling theories on forms for Mr. B. to respond to. These forms are not assigned, just filled out by students who have found a question they are curious about. It’s work like this, supported by explicit instruction of how the spelling system works, that gets students to dive into dictionaries and excited about visiting spelling experts from France! Click here to see how Sean Lonergan’s Grade 5 class build vocabulary development through the use of Jeopardy and how Skot’s Grade 4/5s decode new vocabulary by being word detectives. Both of these classes were stops on Marcia’s visit to Kingston. You can hear Marcia and Pete chuckling in the back ground of the Jeopardy game as this wonderfully rowdy class enjoy a game full of detailed linguistics! This web was on <graph> was created by my class in Balikpapan, Indonesia during my first experience with Real Spelling. An image and description of this activity was featured in Marcia Henry’s book: “Unlocking Literacy: Effective Decoding & Spelling Instruction”. Click here to investigate that book more, or here to order a copy from Amazon. 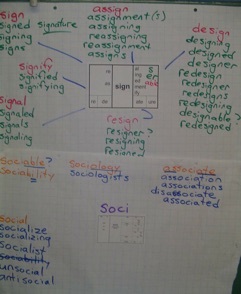 WordWorks can’t take credit for the following example of teaching word structure to young ESL students. However, if you are curious about how this instruction might apply for second language learners, click this delightful image of students working on the bound base <rupt> for break (notice the volcanic e+rupt+ion in the background!). 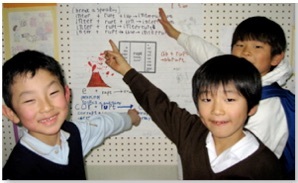 You will jump to a Real Spelling InfoSpell article by Melvyn Ramsden where he describes the amazing work a fellow Canadian, Colin Duff, is doing in his “Literacy Lab” at the Kyoto International School. Once you are there, we encourage you to explore the InfoSpell archives. I encourage you to visit Colin’s amazing website here. You will need to type Kis and smilekis in the password box to get in. WordWorks gets orthographic questions from all sorts of places. Click here for an example of an ongoing orthographic investigation sparked by a teacher at the Island Academy in beautiful Antigua! Is it appropriate to use Real Spelling to teach dyslexic or learning disabled students? 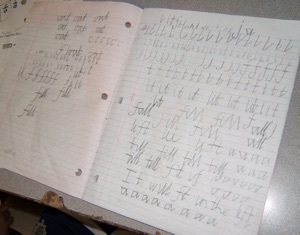 Sean integrates explicit handwriting lessons into his word structure instruction. As children learn to form letters more automatically, they have more working memory available for working with words. Children learn to integrate structural elements of spelling such as common graphemes, (e.g., <ea> <igh>, <th>) and affixes (e.g., <-ed>, <-ing>, <-ness>) into their motor-memory so that these larger elements of the spellings of words become automatized. You don’t get distracted by thinking about the letter-sound correspondence for the spelling of the <-ness> suffix if your hand has been trained in the handwriting of that structural element. Regardless of pronunciation <*busniss> is not a possible spelling. It must be busy/i+ness--> business. An important addition to Real Spelling instruction is penmanship. Instead of printing, students are taught a form of script which is designed for how the hand moves and which capitalizes on the motor memory to teach common graphemes and morphemes, facilitating word learning. See here for more details. As described in this note from Ann that she wrote to me describing the background of this assignment, it is clear that this student worked hard to prepare for this film describing his learning. It is also clear from the way that he speaks that he is not reciting a memorized text -- he is explaining what he understands. I see this presentation as succeeding in part due the fact that this learning is efficiently tied to what we know about how the mind stores and retrieves information. His morphological knowledge reduces the load on his working memory as he organizes his thinking in front of the camera. Having worked at it, he knows the word sum for <dissident> automatically. That word sum allows him to tie the meanings cues within that word to concepts, and those concepts are well integrated in his long term memory from the work he has done in the classroom. See this article by Schnotz & Kürschner (2007) for an excellent review of research on cognitive load theory that addresses these issues. Obviously words are the tools of thought so giving students the skills to analyze words therefore helps them to understand a particular word more deeply as well as expand the repertoire of vocabulary at their disposal. A broader vocabulary helps in expressing ideas in a more focused manner as students sift between synonyms, some more formal some less so, at their disposal. I think the morphemic and etymologic understandings the students have gained throughout the year are beginning to show in their responses. It also clarifies for me areas of confusion or concepts that may need revisiting.